One of the nice features on many of the newer Bluetooth accessories is the ability to update the firmware. BlueAnt Wireless has a handful of Bluetooth headphones and speakers that can be updated reducing the need to replace your Bluetooth accessory. We recently reviewed BlueAnt's S4 Bluetooth Speaker (which is firmware updateable) and discovered that BlueAnt had released an updated firmware version. Firmware Version 1.6 is reported to enhance the integration with BING-411 and newer phones and improve voice prompts. The update process for the S4 is similar to that for BlueAnt's T1, Q1, V1, Z9i and Z9. Curious how the update process went? Ease on past the break to learn more about BlueAnt's update process and how the latest update effected the S4. So, how do tell what firmware version your BlueAnt accessory is running? The easiest way is to go to your Windows Phone's Bluetooth screen and check your paired devices. The firmware version will follow the BlueAnt model. For example, the S4 read, "BlueAnt S4 v1.5". The v1.5 is the firmware version. 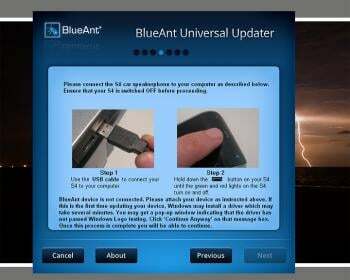 You then head on over to BlueAnt's Website to see what the latest firmware version is. For example, the most current firmware version for the Q1 is v8.19. In my case with the S4, version 1.6 is showing as the most current. From here, you have to register your product, set up a username/password and download BlueAnt's Firmware Updater (10mb file). The Firmware Updater is only compatible with 32 bit, Windows XP and Windows 7 computers. It is not compatible with 64 bit systems or Apple Mac machines. This does limit the availability of updating BlueAnt's accessories. There is no word when a 64 bit version will be available but it is anticipated that Apple support will be ready sometime in October 2010. Once you install the Firmware Updater and launch the program, it will walk you through the update process. From checking for firmware updates to walking you through connecting your BlueAnt headphone/speaker all you need to do is follow the steps. The update process took just under ten minutes from installing the Updater to seeing confirmation that the update was successful. Naturally, future updates will take less time because there's no need to re-install the updater. Updating the S4 is similar to re-flashing the ROM on my Tilt2. The process wipes the device clean and once the process is complete you will need to re-pair the BlueAnt accessory with your Windows Phone. Is the Update an improvement? While having the ability to update your Bluetooth accessories is a great way to keep the technology current, some updates sound good but don't work out so well. 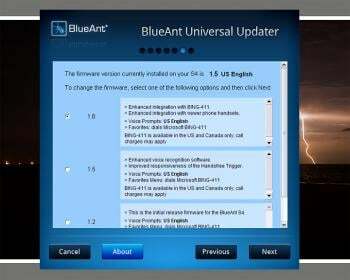 In the case of the BlueAnt S4, the update to firmware version 1.6 has been a noticeable improvement over 1.5. The accuracy and effectiveness of voice prompts to the S4 and to BING-411 has improved. I find myself repeating commands a lot less. 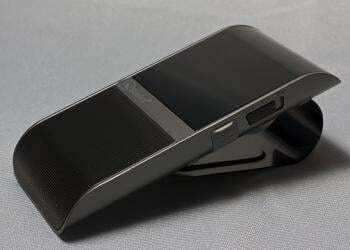 Another improvement is with the random volume changes I experienced during my initial test of the S4. At the time, I've been running the updated firmware for two days and have yet to have a spontaneous volume change. All in all, I'm pleased with the fixes this update made. 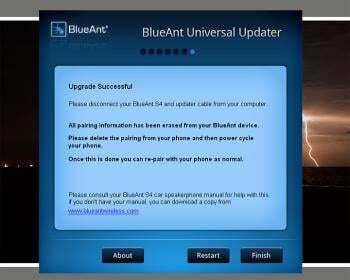 If you own a BlueAnt Bluetooth product that can be updated, head over to BlueAnt's Support Site and see if the firmware is current. If not, getting your Bluetooth device updated only takes a few minutes and can improve the overall performance of your device.